I have a very old photo of me and my mother. I'm about four and she's in her early thirties. She is perky and pretty and I am sour and serious. She called me a sourpuss and I was. 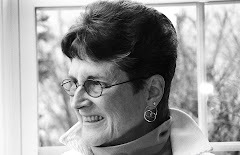 She had proclaimed me a "miracle." I hated being a miracle. But Mom also gave me a book, published in 1934, called The Little Book About God. The book shaped me in ways I didn't understand. 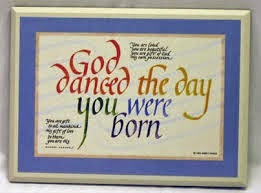 When I was near fifty Mom gave me a framed quote in multicolored calligraphy: "God danced the day you were born." On the sides are smaller inscriptions: “You are loved, you are beautiful, you are gift of God, His own possession.” And: “You are gift to all mankind, His gift of love to them you are His.” She had ordered it from an Abbey Press catalog. Mom has been dead now for 17years, and I can only guess at her motives. What I can say is that such praise was for me unbearable, not to mention quite untrue. Not until after she died and I started to become a woman and a priest, did I retrieve the fullness of myself and know that my mother had given me God. 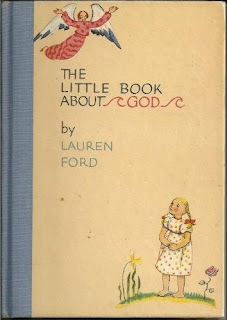 I still have The Little Book About God and the calligraphy. Still, with my penchant for words, I have to include another less personal proclamation in original words written in 1870 by Julia Ward Howe. Howe was an abolitionist. She wrote the “Battle Hymn of the Republic” and worked to establish a Mother’s Peace Day. In 1907 Anna Jarvis of Philadelphia campaigned to have the day recognized as a national holiday, which was accomplished in 1914 by President Woodrow Wilson. This proclamation is still shaping the world and humanity. Our sons shall not be taken from us to unlearn all that we have been able to teach them of charity, mercy and patience. We women of one country will be too tender of those of another country to allow our sons to be trained to injure theirs.